I love stuffed roasts, they are delicious and slice very pretty. For this roast – I was experimenting with the stuffing, and never intended for this recipe to end up on the blog, and therefore didn’t take any step by step pictures. Having posted this picture in a Cooking group on facebook was asked for a recipe, and here it is. I do not include the measurements for the seasonings, as I was tasting and adjusting as I went. The next time I make a stuffed roast, I will make sure to take step by step pictures and write down the proportiins for seasings. This recipe can be prepared both in a slow cooker or a dutch oven. *Special equipment -slow cooker or a dutch oven. Montreal Steak Seasoning, or Salt, Pepper, Dry garlic, coriander. Sautee the onions until they just start caramelizing. Add spinach to onions and garlic and sautee until spinach wilts and turns bright green. Spread the spinach mixture over 2/3 of the meat leaving space at the edge. Roll the up the meat as for a jelly roll or strudel to enclose the filling completely. For slow cooker :- Place the tomato sauce, wine, mushrooms with water and any leftover filling into the slow cooker insert or dutch oven. Mix and place the roast on top. set to cook on High for 4 hours or Slow for 8. 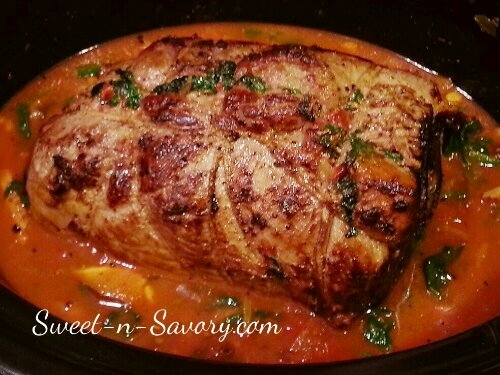 For dutch oven :- Preheat oven to 350 F. Add wine into the slow cooker and bring to a boil, add the tomato sauce, mushrooms with water, add any leftover filling and the roast.Cover with a lid and place into the oven. Bake for about 2 hours, basting every 30 minutes.